Dr. Kelsey Hopkins, of Greenville, is the recipient of the 2018 Physician of Excellence Award from the Illinois Rural Health Association (IRHA). This award is presented to physicians who have an important impact on the health of rural communities with a dedication to providing access to quality healthcare to underserved areas. Margaret Vaughn, IRHA Executive Director honored Dr. Hopkins during a reception on Wednesday, October 17, 2018 at the Kroeber Room on Greenville University. Dr. Hopkins grew up in Maple Park, IL and attended the University of Illinois at Urbana-Champaign where he earned a bachelor of science in biology. Thereafter, he attended the University Of Illinois College Of Medicine at Rockford and completed the Rural Medical Education (RMED) program. During his medical school career, Dr. Hopkins was inducted into the prestigious Alpha Omega Alpha (AOA) Honor Society and the Arnold P. Gold Foundation Gold Humanism Honor Society. 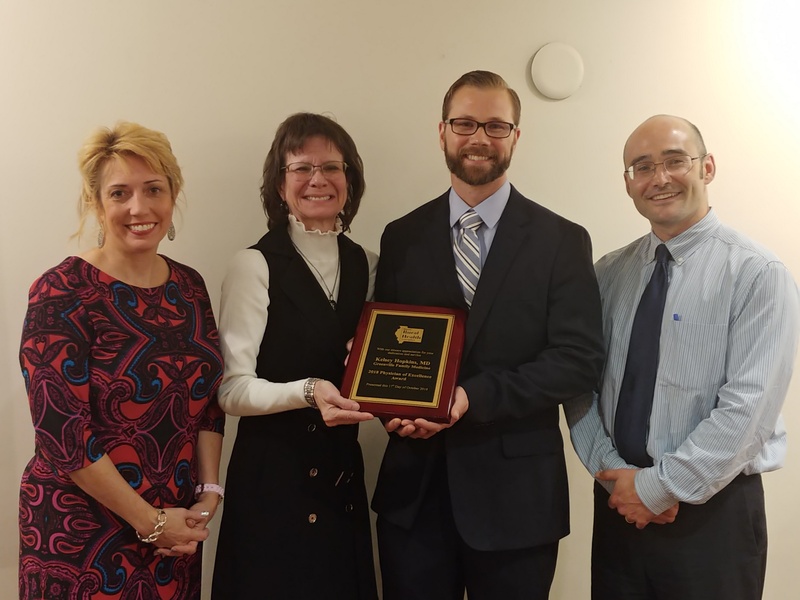 He completed his Family Medicine residency training at Union Hospital in Terre Haute, IN as chief resident and received additional training through the program’s Rural Training Track. He is a diplomate of the American Board of Family Medicine and is passionate about teaching. Dr. Hopkins serves as a member of the RMED Recruitment and Retention Committee for the University Of Illinois College Of Medicine at Rockford. He is an Assistant Clinical Professor in the Department of Family and Community Medicine at the University Of Illinois College Of Medicine. He is also a medical director for Greenville Nursing and Rehab. Dr. Hopkins is an active member of the Southern Illinois Medical Association, currently acting as second Vice-President. Dr. Hopkins and his wife, Brenna, and 3 children have called Greenville home since 2010.